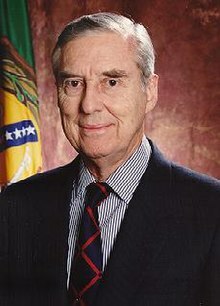 Lloyd Millard Bentsen Jr. (February 11, 1921 – May 23, 2006) was a four-term United States senator (1971 until 1993) from Texas and the Democratic Party nominee for Vice President in 1988. He also served in the U.S. House of Representatives from 1949 to 1955 and as Chairman of the Senate Finance Committee and as U.S. Treasury Secretary. [A] fellow from Texas can tell the difference between grass-roots and AstroTurf. Apparent 1985 coining of the term astroturfing, meaning "creating or operating fake 'grass-roots' campaigns"
Cited in Young, Henry (2 November 2009). "Astroturf Lobbying Organizations: Do Fake Grassroots Need Real Regulation". Illinois Business Law Journal. Retrieved on 2010-03-27.
quoted in Taylor, Paul (24 March 1990). "Democratic Leaders Talk Tough on Taxes;President's Promise Not to Impose New Levies Is 'Pure Bushlips,' Sen. Bentsen Declares". The Washington Post: p. A6. ISSN 0190-8286.